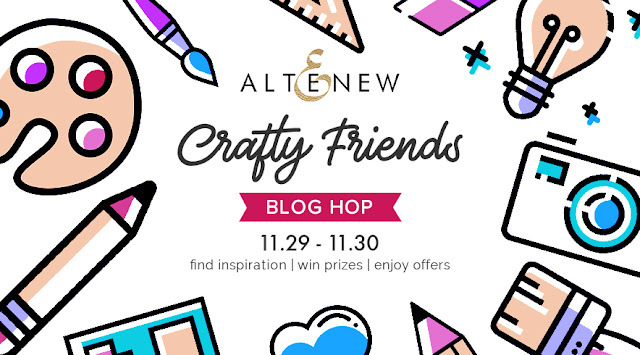 I'm so excited to be joining the Altenew Crafty Friends blog hop today! You should have arrived here from Jessica's blog. Over the years I've received many amazing opportunities in the paper crafting industry, which I am so very grateful for! However, what I am most grateful for is the friendships I have made through crafting. I wouldn't be here without the constant support of crafty friends, who cheer me on, are not jealous of my success and are there for me when I'm down. I've made several good friends through crafting, some of them I talk to daily. I will only mention the two closest, otherwise I'll never finish this blog post hehe! Both of these Ladies I've been friends with for about 3 years. One is Altenew's very own Enza Gudor, who besides being a talented crafter, is also an amazing person! We are the same age, grew up with the same values, we have quite similar way of thinking. Fun fact (she will kill me for this), as much as we have in common on the inside, we couldn't be more different on the outside. Apart from the fact that she is a brunette with gorgeous Italian olive skin, I'm blond and have very fair skin - I'm pretty tall, and she is tiny (I won't say how tiny cos she really WILL kill me), so I often tease her that we are TWINS. You know like Arnold Schwarzenegger and Danny DeVito :D. My dear Peperina, if you read this, I love you lots! And then there's this crazy chick that calls herself the crazy paper lady, Thi Tran, who I started talking to on a Facebook platform all those years ago. She loves crafting but doesn't share a lot of her work online. We talk a lot about life, crafting and Netflix hahaha! I actually met her in person because she lives in one of my fave places in the whole world, New Orleans! We visited last year and of course Thi took me to all the craft stores! She is just such a funny, cheerful, down to earth person - I love her! By the time this post goes live, she will just have delivered her 3rd baby! I'm so excited for her! THANK YOU to all my crafty friends for making my life better - you know who you are <3. I can only hope you feel the same way! I promise I'm getting to my projects too :). Right now! I made two top folding, A2 size card bases. I created two A2 size panels which I embossed in gold. The two stamps I used for this: the Rustic Linen and the Dainty Swiss Dots stamp sets. I then die cut two panels from white card stock, using the Watercolor Stripes Cover die. I then assembled my cards and stamped the sentiments directly onto the card fronts. 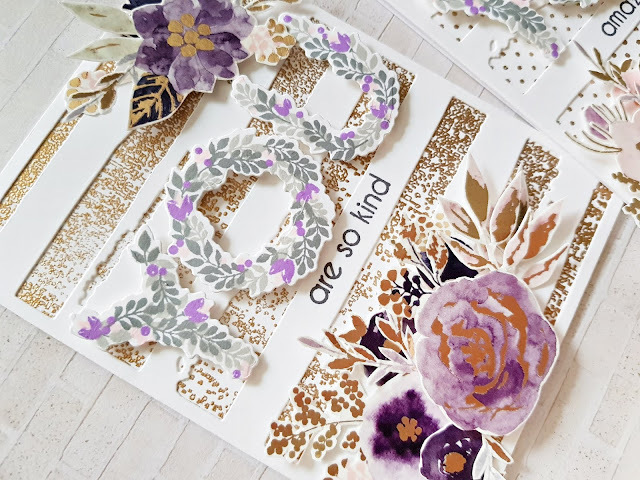 I stamped and die cut the word YOU twice, using the super stunning Botanical You stamp and die bundle. I placed these above my stamped sentiments and popped them up with pop dots. I fussy cut out a bunch of flowers from the Glitter Flurries washi tape and arranged them on my cards the way I liked them. Once I was happy with the way they looked, I glued them down. And this finishes off my cards for today! Altenew is offering free US shipping with code CRAFTY18 or $5 OFF international shipping with code FRIENDS18 at checkout. Offer valid from 11.29.2018 at 12:01 am EST through 12.01.2018 at 11:59 pm, EST. Not valid on prior purchases. Cannot be combined with other promo codes. Be sure to leave comments by Sunday, December 9th, 2018 for a chance to win! 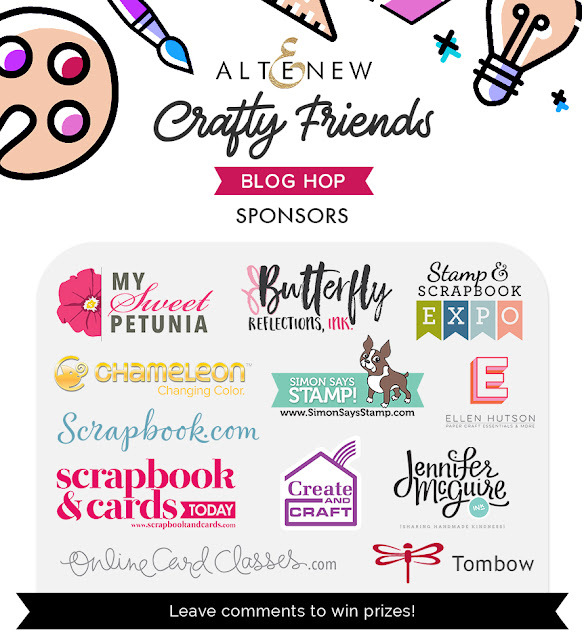 37 winners will be chosen at random from the comments left on all blogs listed below and will be announced on the Altenew Card Blog and the Altenew Scrapbook blog on December 15th, 2018. I will also draw a winner here on my blog, to receive a $20 gift certificate. So comment away! Thank you all for your sweet comments! I apologize for not answering all, I'm only able to answer from my phone and it takes ages. For some reason answering from my PC hasn't worked for months and I can't figure out why :(. I'm really sorry! So the winner is Melissa Smith! Congratulations! Please contact me at mzs6666@googlemail.com so I can tell you how to pick up your prize! I hope you like today's inspiration! Thanks so much for stopping by today! Your next stop is Meghann Andrew! I'm going to include the full blog hop list down below! What fun! Thanks for the inspiration and the giveaways!! Have a bewautiful day! I like the way you used the washi tape. Thank you! Brilliant use of the washi.. Gorgeous cards..
Oh my I love your cards! They have a scrappy feel and remind me of days at the scrapbook store, I made cards in a sea of scrappers, ha! These cards are absolutely gorgeous! So unique! Thank you for your inspiration! So pretty! What a great way to use washi tape. LOVE the gorgeous designs on these cards!! Wow, the cards are beautiful! Love how you cutaway the flowers from the washi tapes for embellishing! I love the pretty cards you made for your friends, very sweet! So very gorgeous! Love the color combo of pink, purple & gold. Lovely cards!Thanks for the inspiration! What a wonderful blog hop to celebrate this great international crafty community! Really pretty colors. I like the popped up You. I love your cards! Really beautiful! I have that cover die. It is one of my favorites. Your cards are just absolutely amazing! I just love those cards. The embossed backgrounds just really make the rest of the card stand out. Beautiful! Beautiful! Great job w/ the fussy cutting (more power to you!). Your cards are very pretty. It would be fun to try a similar layout (with the cover die) using some of the Altenew washi tapes, too. Thanks for sharing! Love your use of washi tape here. These cards are so pretty. Really pretty cards. I like how you used many different elements and they all worked together so well. Beautiful cards! The colors are so pretty and I love the washi backgrounds behind the die cuts. Your card is filled with so many layers! So dynamic, very nice! So many details, your cards are fantastic! Beautiful cards. Thanks for sharing! I love gold and your gold backgrounds are just beautiful! You have just added one more item to my list of wants - watercolor stripes cover die. What an amazing pair of cards. Such a beautiful card, thank you for sharing! These are STUNNING!!! I love the pretty colors you chose!! Lovely use of the washi tape. These are just beautiful. Love the card designs and the use of the washi tape. These are JUST SO AMAZING! I love the designs and soft colors! So much to love! Colors and designs are wonderful. Thank you! creative cards!! thanks for sharing! Beautiful cards and thanks for sharing about your crafty friends. Very unique , I really enjoy your eye . Amazing beautiful cards!! Love them!! We can never have too many flowers, and your card reminded me of some I need to remember to use. Beautifully done. Stunning cards. I love the use of the washi tape that you fussy cut for the floral images and the YOU die that you used. Thanks for sharing your time and talent with us. Lovely!! I love the gold glitter!! Pretty flowers and colors! Love these cards. They are absolutely gorgeous. The colour combo is beautiful. I have never tried this interesting style. thanks for the inspiration. Oh wow! Both cards are stunning with the Altenew yumminess! What a cute layout, soft colors you chose ore very elegant! Yowza!!! These are stunning. So soft and delicate . Your cards are so beautiful. I love the different layers and the use of different materials. The colors you chose are so gorgeous together! Zsoka both cards are gorgeous with all of the elements you used. The florals (of course) are beautiful and the backgrounds set them off perfectly. Well done. Love all your cards. This is really pretty! Such pretty cards! Love the papers peeking through the cover plates! Pretty card and color combinations! I love the delicate little flowers in your design! This is SO PRETTY! Amazing inspiration today! Very lovely palette and really cool way to use the negative space of the die cuts - thanks for sharing! Beautiful cards! Love the designs. Wow, cards are so beautiful! Amazing Cards. I like them very much. These are beautiful. I don't have many crafty friends. My non-crafty friends think I'm certifiable and maybe I am but I love it. TFS! I was wondering how the letters had different colors incorporated into them. The stamp sets are awesome! Very , very pretty. Thanks for sharing with us. Beautiful cards! I enjoy the layers and texture! A great layout and layers! That's a great background. Beautiful!! Thanks for the fun. Beautiful cards, love the glitter and all the layers with these pretty flowers. This are very nice. I like the white one better. I think the "You" stands out better and I love the crispness that white has. so soft and lovely, beautiful flowers on each too! Those cards are totally beautiful! Great Job! Oh gosh, it's beautiful! So striking, and so inventive. amazing, gorgeous cards! love them all! Enjoying the Crafty Friends blog hop! So many fabulous creations! Lovely cards! Lovely cards! The gold embossed backgrounds are so pretty with the flowers from the Glitter Flurries washi tape. I love how you incorporated the Botanical You into your card design. Thanks for sharing. Very creative eclectic layout. Love the way you used the washi tape--I had not thought of using it that way. TFS--have a blessed weekend. I like this unique dessign. Love your cards and crafty friends stories. Thanks for sharing! Love your "twin" story. Your card is beautiful and I esp. like the embossed background. Lovely, unique design. Thanks for sharing. Very sweet cards. Love your color choices. Thanks for sharing! How lovely are these?! You combined a lot of lovely Altenew products together, and the end result is truly inspiring1 Thanks for sharing! Very pretty, love the colour scheme. Very pretty projects and nice story about your 2 crafty friends! Beautiful washi tape project. So pretty! So pretty! What a great colour combination with the washi tape. Thanks for the inspiration! I just love those floral letters! Both are lovely!! Wow! Gorgeous! I love how your cards are the same, but different. 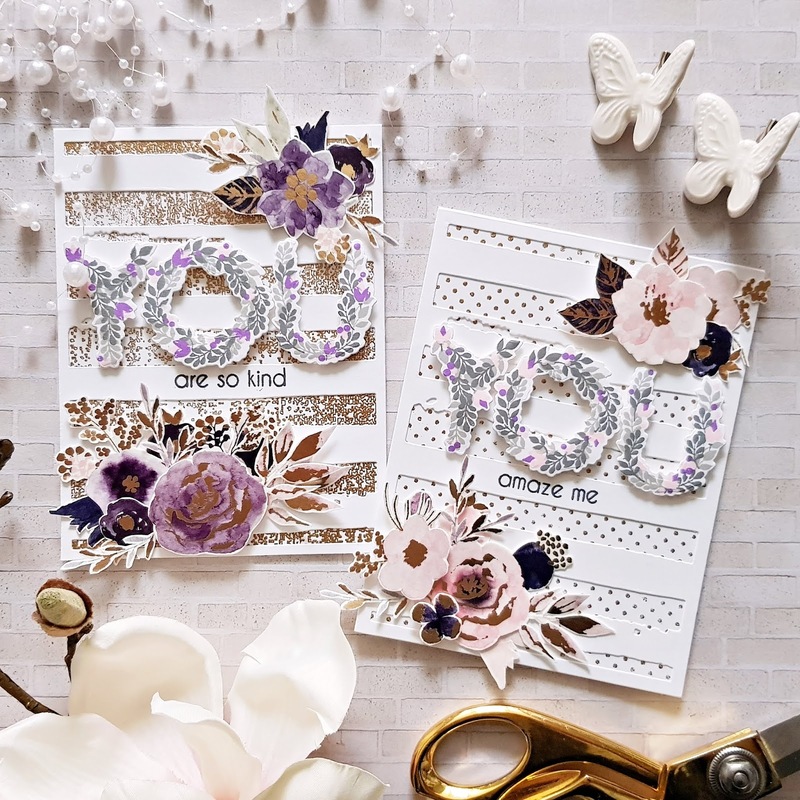 Just like how our crafty friends can be the same, but different, and yet they each are beautiful, just like your cards. 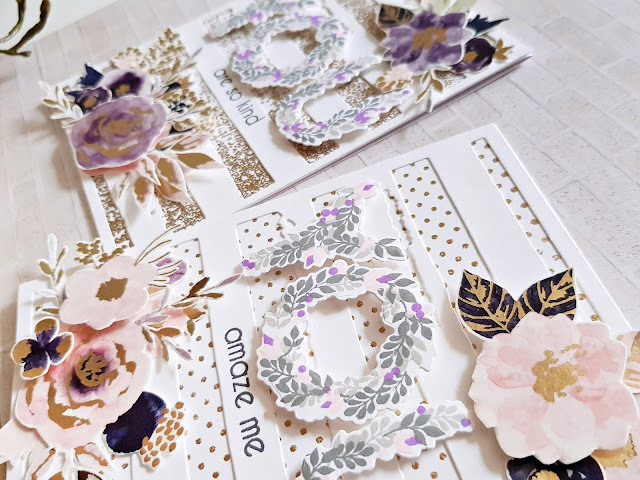 Beautiful cards - I love that background die and all the different styles of cards that can be made with it! Zsoka, what a gorgeous cards, love the way you made the backgrounds, that's something I have to keep in mind for my own cards. Thanks also for the lovely story to begin this Crafty Friends Blog Hop. you used that washi tape so beautifully on your cards! Beautiful cards! I LOVE that washi tape! Ha ha..I loved reading about your two closest crafty friends !! Your cards are beautiful. The Washi tape is so versatile!! I love how you used it. Beautiful cards!! I enjoyed reading about your closest crafty friends! It's always fun when your journey brings you more friends. I love your cards...the colors, the placement, the floral "YOU",...All beautiful! What fun stories about your crafty friends. And these cards are perfect; I love the purples and greys of the YOU stamp and how it goes with the fussy cut florals. And the peekaboo embossing is amazing as well. Just some really pretty composition going on here. Thanks for sharing! Really pretty and feminine cards...love the sparkle! I have been wanting to try the washi tape cards for quite a while but it is moving up on my list to do as soon as I get through the holidays!!! Thanks for inspiring! Both of your cards are gorgeous. You've combined some of my favorite products here and I can't wait to try your designs! The Glitter Flurries washi tape is so beautiful, I sure hope Altenew restocks it soon (I'm having to be a hoarder with it lol). Thank you for sharing your "crafty friends" story, your cards, and the awesome inspiration. Beautiful cards, love all the floral elements and pretty colors. Gorgeous design and I love the soft delicate flowers and colors. You've shared two lovely cards and heart warming anecdotes about your crafty friends. Beautiful cards! Love the color scheme, and the look of the fussy cut flowers and sentiment. Thanks for sharing! Gorgeous color and gold accents!